Oklahoma City’s Graham Colton, whose music has been heard in film and screen, including The Tonight Show and American Idol, has agreed to lend an acoustic version of his popular song Love Comes Back Around for the Brent Weber documentary Real Live Angels. Colton’s music joins that of Laguna Beach’s Nick Hernandez (Nick I) and his band Common Sense as well as California singer-songwriter Jamie Bolduc. The movie even includes an original camp song, written by Camp Summit staffers many years ago that is an integral part of the camp experience. It is performed by Weber’s daughter Nicole Weber, an actress whose work with Camp Summit introduced the filmmaker to the story. Real Live Angels is a documentary by Brent Weber, produced in conjunction with his graduate studies at the University of Oklahoma’s Gaylord College of Journalism and Mass Communication, which introduces the viewer to a summer camp for people with disabilities in north Texas. “(The movie) is a heartwarming look at how inclusion can change lives, and how volunteerism and an open heart are keys to changing the world we live in,” said Weber. Colton has been generous in the past in supporting causes alongside Weber. 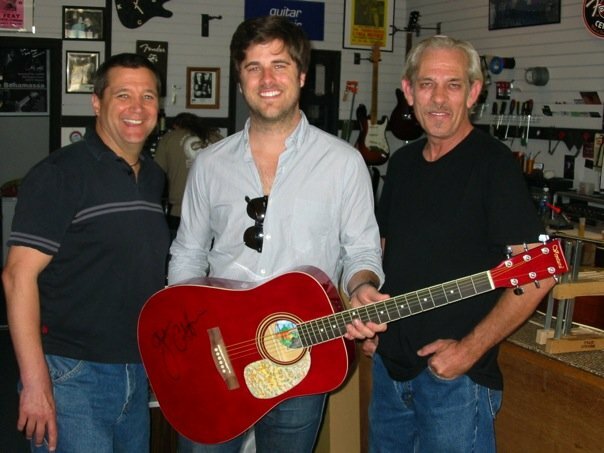 In 2009 Colton played and autographed a guitar crafted with rare, inlaid materials by Western Avenue Graffiti Bridge artist Randy Powers. It raised $1,000 at auction for the Leukemia Lymphoma Society’s 2009 Man & Woman of the Year Gala. (Photo included) The guitar was provided by Guitar Stand in Oklahoma City. You can hear a clip of the song, included on Colton’s Twenty Something EP, by visiting iTunes. For more information about Colton’s music, please visit his website. His latest album Lonely Ones was released January 21, 2014. You can see and hear a recent interview with Graham below from Chevy Music Showcase, as well as links to a pair of visits he made to the morning news set a few years back.